The configuration of the town or “Burgo vello” of Melide responds to a medieval layout of a village structured around a long main street, between the “Castelo” and the old parish church of Saint Peter (today destroyed). This old and historic Street was the backbone of Melide in the middle ages and the modern age. That is why the main public buildings, collected in documentary sources, were located there: The house of Balancas where they regulated weights and measures, the salt house, the wine house, the house of the green barrel (which could be an Inn, storage for wine or a workshop to make barrels or measures of wine) the butchers, the house of Romay and inn where the sculptor Francisco de Castro Canseco had his workshop, the big inn, the Temple house (property of the Order of Temple) also the old Saint Peter´s Hospital, documented in the year 1205. 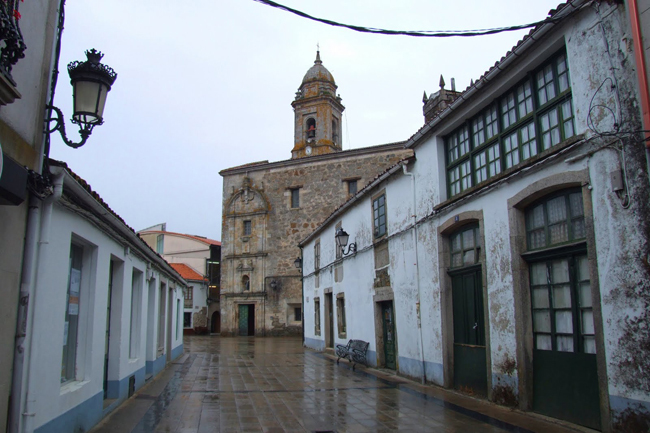 They also refer to houses of clerics, shoemakers, tailors and judges, which denotes the role played by this street throughout its history, as well as being one of the two urban variants of the Camino de Santiago, once the pilgrims crossed the Door of Saint Peter located at the beginning of the street. During the middles ages the town was surrounded by a Stone Wall in which six doors were opened to narrow and intricate streets within the old town. One of the doors of medieval wall, known as the Door of Abeancos opened onto the current street Alberto Lafuente between the Pensión Esquina and the Bar Liñares through which the real “camino” passed through from Ourense. It appears being named in the Tumbo de Sobrado: “año de 1587… una casa en Mellide… con su alto y baxo y el cillero a la puerta de Abeancos…”. On the same site where the building of the Esquina guesthouse was built in the 70´s, there used to be an old tavern and food house that was known as the “Teeth Tavern” or “the Chemist on Duty”. This old tavern operated from the 1930´s to the year 1977 when the Bar Esquina opened its doors.